CNBC's sports business reporter Darren Rovell put out 100 Rules for Twitter early this month, and inspired by that list, Tom Satkowiak of the University of Tennessee's athletic media relations responded with 50 Twitter Rules for Division I Student Athletes. I have to say Twitter wouldn't be quite as much fun as it is if everyone followed these rules, but it's important for student-athletes (and anyone else for that matter) to know what is considered appropriate in the ever-expanding social media sphere, and this list does a very good job of establishing the straight-and-narrow. Division III Colorado College announced that Todd Doebler, who was Penn State men's coach for the past five years, has been hired as director of tennis. He will coach both the men's and women's tennis teams. The Penn State release reveals that assistant Brendan Lynch is also departing, and will become assistant at Cornell. In two other assistant coaching moves, Baylor's Chris Brandi is leaving the Bears and tennis to take a position with Oracle in Austin, Texas, while Sean Maymi has left the assistant's position for University of Michigan men's team. And outside college tennis news, Liam Smith, formerly of the Harold Solomon Institute in Ft. Lauderdale, has been named Head Coach of Tennis Australia's National Academy in Sydney. Qualifying for the Mercury Insurance Open, the WTA event in Carlsbad, Calif., and the ATP Legg Mason in Washington, D.C. began today, with many junior and college players in the draws. Most were not able to progress to the second round of qualifying, but Jessica Pegula and Zoe Scandalis did win their opening matches in California, with Pegula beating No. 16 seed Tammi Patterson of Australia 6-4, 6-1 and Scandalis, a USC incoming freshman, defeating No. 5 seed and WTA No. 147 Kai-Chen Chang of Taiwan 7-5, 6-1. The three junior boys in the Legg Mason qualifying--Andrew Adams, Henry Steer and Mitchell Frank--will not have to worry about getting to Kalamazoo in a hurry, as they all lost in the first round today. Frank took No. 1 seed Matthew Ebden of Australia, ranked 139, to three sets, but fell 6-3, 3-6, 6-3. The University of Virginia trio of Michael Shabaz, Jarmere Jenkins and Alex Domijan also failed to advance. There is also qualifying going on in Vancouver's Pro Circuit challenger for men and women, which are both now $100,000 events. The men's qualifying began today; the women's will start tomorrow. The tournament announced on twitter today (@VanOpen) that Bradley Klahn and Steve Johnson were both given main draw wild cards. Irina Falconi, who lost to No. 2 seed Nadia Petrova of Russia 1-6, 6-1, 6-3 in the semifinals of the WTA's CitiOpen today, is also in the field. College players will win the Futures events in the Midwest this week, with Fresno State alum Rudy Siwy taking on Tennessee junior Tennys Sandgren in Godfrey, Illinois' $10K final, and Michigan graduate Denise Muresan facing 2008 NCAA champion from Georgia Tech Amanda McDowell for the title at the $10K in St. Joseph, Missouri. 2011 NCAA champions Jeff Dadamo and Austin Krajicek won the doubles title in Godfrey. With the USTA Boys 18s and 16s National Championships beginning a week from today, it's time to close the books on the Clay Courts. Here's my recap of the Girls 18s event in Memphis for the Tennis Recruiting Network, and Marcia Frost's on the Boys 18s for TRNet. Make sure you read all eight articles on the Clay Courts while you're visiting the Tennis Recruiting Network's website. The acceptance list for the US Open Juniors has been published at the ITF Junior website, with six US boys and six US girls receiving direct acceptance into the main draw. The boys, with their current ITF rankings, are: Bjorn Fratangelo(3), Marcos Giron(23), Shane Vinsant(28), Mitchell Krueger(32), Mac Styslinger(41) and Alexios Halebian(44). Connor Farren and Dennis Novikov, a quarterfinalist last year at the Open, are in the qualifying draw. The girls who received direct acceptance, with their current ITF rankings, are: Lauren Davis(14), Madison Keys(17), Vicky Duval(24), Grace Min(25), Christina Makarova(42), and Jessica Pegula. Pegula received direct entry based on her WTA ranking of 341. She is at 350 this week. Gabby Andrews is the first alternate, which means she will almost certainly get in, and she has earned a wild card, in any case, with her victory at the Clay Courts on Sunday. 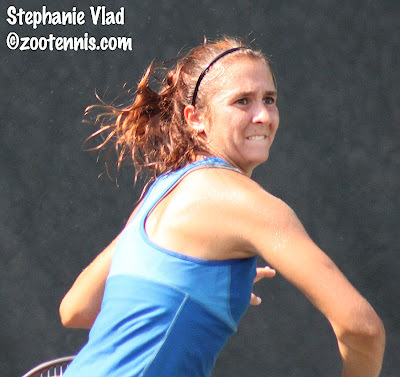 Stephanie Nauta, Kyle McPhillips and Allie Kiick were placed in qualifying based on their ITF rankings, while Krista Hardebeck and Nicole Gibbs are in qualifying based on their WTA rankings. 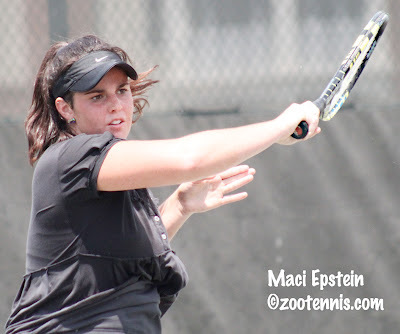 McPhillips has earned a wild card into the main draw with her Easter Bowl victory, but that won't be officially announced until much closer to the date of the tournament. The girls field features the defending champion in Daria Gavrilova of Russia, who recently took the top ranking back from An-Sophie Mestach of Belgium. Russian Yulia Putintseva, who was a finalist last year, and has been successful on the ITF Women's Circuit this summer, is also returning. Australian Open girls champion Mestach, who has not played in juniors or on the professional circuit since May, is not entered in New York, and two other top 10 junior girls are also passing: No. 5 Ons Jabeur of Tunisia, the French Open champion, and Puerto Rico's Monica Puig, a finalist at the Australian and French junior championships this year. The boys field has all of the top 10, and the only notable boys not entered are No. 14 Roberto Carballes Baena, the European champion, and fellow Spaniard Andres Artunedo Martinavarr, who together won the French Open boys doubles this year. The complete entry lists can be found at the ITF junior website. In other news, I've just gotten through all my Google Reader entries from last week and found a couple of interesting items to pass along. The Evansville Indiana Courier and Press spoke with Brooke Austin about her tennis ambitions in this article, published last week in conjunction with the $10,000 Pro Circuit Women's event there. The Junior Tennis Champions Center in College Park, Maryland is the subject of this Baltimore Sun feature, with its role as the prototype for USTA Regional Training Centers spotlighted. Cal Poly's men's head coach Justin McGrath has resigned, according to this article in the San Luis Obispo's The Tribune. McGrath denies that an NCAA investigation into the program is the reason for his departure. And finally, ignore the headline, and read Kamakshi Tandon's article at espn.com about the young US women looking to have an impact on the WTA tour. The USTA announced the names of the players representing the United States in the ITF World Junior Tennis competition for players 14 and under August 1 though August 6. Mike Sell will coach the boys team of Stefan Kozlov, Eduardo Nava and Henrik Wiersholm, while Troy Hahn will coach the girls team of Julia O'Loughlin, Cristina Rovira and Katerina Stewart. I suspect the boys team will be one of the top seeds, with perhaps Romania, but with only O'Loughlin playing internationally in the winter Tennis Europe tournaments, I doubt the girls will be. The US girls have won the past four championships, an unprecedented streak. The US boys last won in 2008. The complete release can be found at usta.com. The fact sheet and names of the other countries participating can be found at the ITF junior website. Last week in Jamaica, Richard Del Nunzio and Blair Shankle of the US claimed singles titles at the ITF Grade 4. It is Shankle's second title this month. Del Nunzio defeated fellow American Austin Siegel 3-6, 7-6(4), 6-3. Both Shankle and Del Nunzio were the top seeds. Siegel won the doubles title with Walner Espinoza of Panama, their second doubles title in the past two tournaments. At the Farmers Classic in Los Angeles last night, NCAA champion Steve Johnson lost to Gilles Muller of Luxembourg 2-6, 6-3, 6-4 in the first round, and today Dan Kosakowski was beaten by Ernests Gulbis of Latvia 6-2, 6-4 in the second round of the ATP event. The Los Angeles Times spoke to both about their futures on the professional tour, with Kosakowski explaining why he was leaving UCLA after one year, and Johnson discussing his return to USC for his final semester of eligibility, although playing professional events as an amateur the rest of this year. 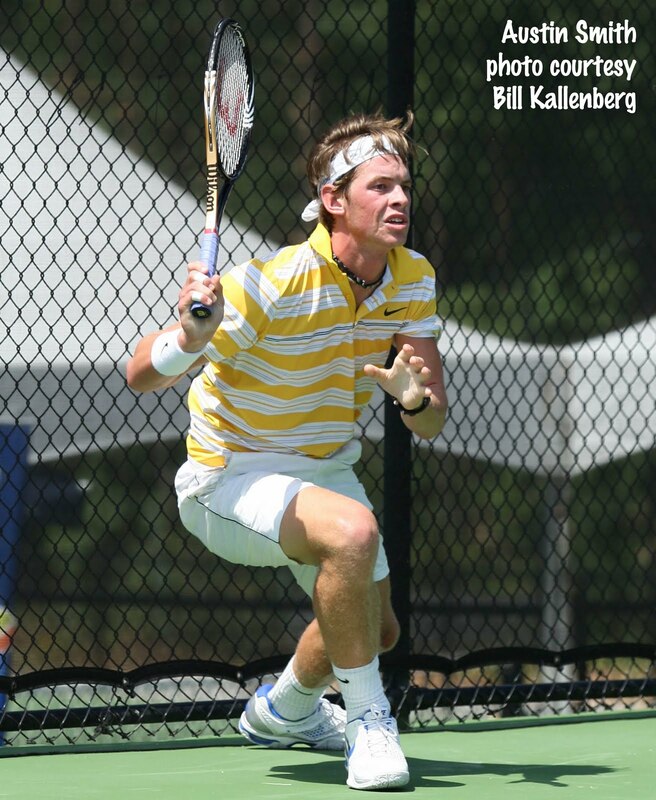 The Tennis Recruiting Network began its coverage of the USTA National Clay Court Championships today, with recaps by Ali Jones on the Boys 12s in Winston-Salem, NC and by Sonny Dearth on the Girls 16s in Virginia Beach. A couple of local papers in Florida also provided coverage of two of the events there. There isn't much coverage of the final matches in the Boys 18s and 16s championships in Delray Beach in this Palm Beach Post article, but it does contain the news that Alexios Halebian has turned pro. Halebian had not made it official when I spoke to him at the Easter Bowl, but he had every intention of signing with CAA this summer, although if that has happened, there has been no public announcement of it. I will talk with Halebian about it again next week in Kalamazoo. 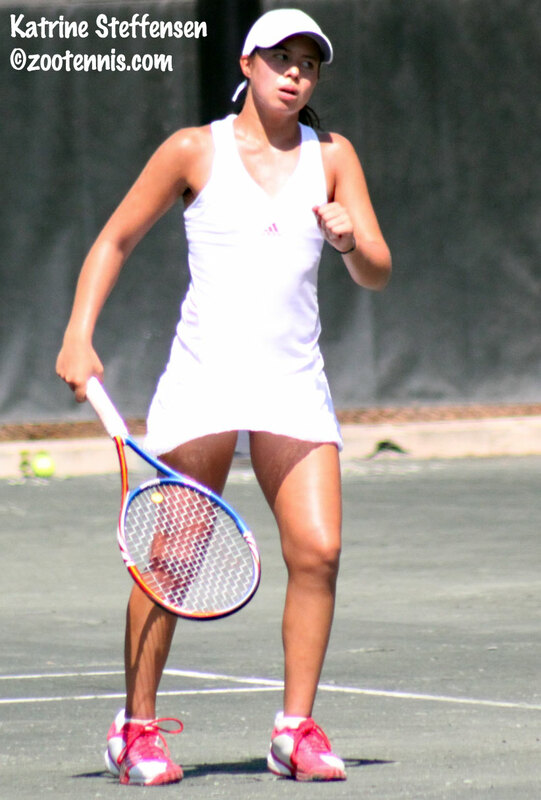 Madison Bourguignon's win at Plantation in the Girls 14s received coverage from the Sun-Sentinel's Harvey Fialkov, who does provide some observations about the match between Bourguignon and Katerina Stewart, the Easter Bowl finalist. 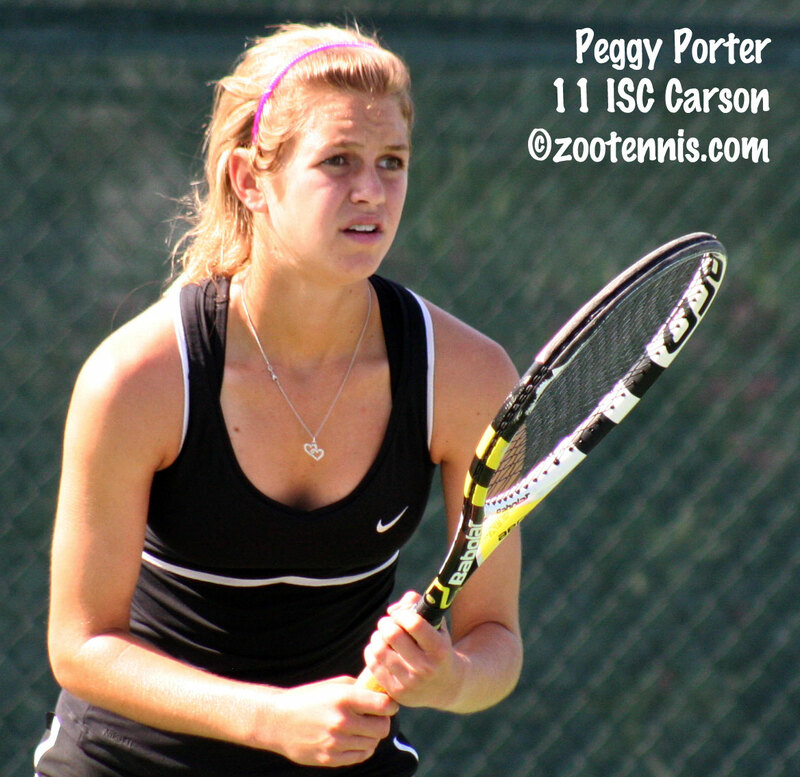 Tennis Recruiting will be providing coverage of the Boys and Girls 14s on Wednesday. Last week on the Pro Circuit, unseeded Chichi Scholl won her first $50,000 title, defeating former USC star Amanda Fink, a qualifier, 6-1, 6-1. With the win, Scholl has broken into the WTA Top 200, at 185, a career high. She also won the doubles with Tammy Hendler of Belgium, the first time the two had played together. Scholl, 19, and Hendler, who will be 19 next month, beat top seeds Lindsay Lee-Waters and Megan Moulton-Levy 7-6(9), 3-6, 10-7. Recent Tennessee graduate JP Smith won his first singles titles as a professional last week in Tulsa, and also taking the doubles title with another former Volunteer, Ben Rogers. Smith, who had to qualify, didn't drop a set in any of his seven wins, beating former Minnesota standout Chris Wettengel, also unseeded, 6-1, 6-1 in the final. University of Virginia recruit Mitchell Frank reached the semifinals before falling to Smith 6-3, 6-1. Smith and Rogers, unseeded in doubles, beat another unseeded team with Fresno State backgrounds, Rudy Siwy and Nick Papac, 6-2, 6-3. For more on Smith's wins, see the Tennessee athletic website. In the women's 10K in Evansville, former University of Utah player Elizabeth Ferris, the No. 4 seed, beat unseeded Nicole Melichar 6-2, 6-1 to claim her first professional singles title. According to this article in the Evansville Courier and Press, the soon-to-be-18-year-old Melichar has not yet decided whether to turn pro or attend college. The doubles title in Evansville went to University of Tennessee's Brynn Boren and University of Southern California's recruit Sabrina Santamaria. They beat Ferris and Nadia Echeverria Alam 6-4, 4-6, 11-9 in a battle of unseeded teams. In the Lexington men's $50,000, Wayne Odesnik won the singles title, and Jordan Kerr and Davis Martin took the doubles. With all the pro events this week in the US--two WTA and one ATP-there are just two $10,000 Pro Circuit tournaments on the schedule. The men are in Godfrey, Ill. and the women are in St. Joseph, Mo. Dan Kosakowski, the 19-year-old from Southern California who just completed his freshman year at UCLA and has since turned pro, won his first ATP match this afternoon at the Farmers Classic in Los Angeles. Kosakowski, who won three qualifying matches, beat fellow qualifier Tim Smyczek 2-6, 6-1, 6-3. Ken Thomas of radiotennis.com, who is webcasting the matches, kept commenting on Kosakowski's poise, which seemed to surprise him, but didn't surprise those of us who have watched Kosakowski as a junior. Earlier this year, Kosakowski had lost to Smyczek in the first round of qualifying at the BNP Paribas Open in Indian Wells 6-3, 6-2. Kosakowski will play Ernests Gulbis of Latvia in the second round. In one other notable result from a pro event, 17-year-old wild card Eugenie Bouchard of Canada, ranked No. 6 in the ITF Juniors, won her first WTA tour level match, beating Alison Riske of the US today at the CitiOpen in College Park, Maryland 6-3, 6-2. I will have more on the other Clay Court championships on Tuesday, as will the Tennis Recruiting Network, but if you are looking for the winners of all four divisions, they appear in my Honor Roll at left. The slideshow and videos from the Girls 18s Clays will also be up later this week. It was announced today that Jack Sock is turning pro. A deal with CAA Sports, which represents Novak Djokovic and Andy Murry, has been rumored for several months now, and apparently that agency, which also represents Lauren Davis and Ashleigh Barty, got Sock a clothing endorsement deal with Adidas. Sock had been sponsored by Nike, without compensation of course, prior to this signing. Along with Adidas clothes, the sponsorship comes with the opportunity to train with other Adidas-sponsored players in Las Vegas. I spoke with Sock's longtime coach Mike Wolf today, and he said Sock would be training for the next week with the likes of Gil Reyes, Andre Agassi's friend and trainer, while hitting with Jo-Wilfried Tsonga and Juan Monaco. After that, Wolf and Sock will travel to Kalamazoo, where Sock will defend his 18s National title with an eye toward winning the US Open wild card that goes with it. If he does not repeat as champion, Sock will likely play the USTA's US Open wild card tournament in College Park Maryland, August 18-20. For more comments from Sock about his decision, see this article from the Lincoln Journal-Star. Today at the ATP Farmers Classic in Los Angeles, Daniel Kosakowski, the now-former UCLA Bruin, defeated Denis Kudla 6-4, 7-6(4) to advance to the main draw of the tournament. Kosakowski, 19, had beaten No. 1 qualifying seed and 106th-ranked Tatsuma Ito of Japan 6-0, 6-2 in the second round of qualifying Sunday. He will play fellow American qualifier Tim Smyczek in the first round Tuesday. For more on Kosakowski's win over Kudla today, see this article at uclabruins.com. NCAA champion Steve Johnson, who qualified into the main draw last year in Los Angeles, received a wild card into the main draw this year, and will play Gilles Muller of Luxembourg in the first round, also Tuesday. College coaching legends have been in the news a lot lately, with the move of Bob Hansen from UC-Santa Cruz to Middlebury, and the passing of former Kalamazoo College tennis coach George Acker last week. Today comes the news that Furman's Paul Scarpa, who holds the NCAA Division I record for wins with 853, is retiring. Scarpa coached the Paladins for 45 years and won 17 Southern Conference titles. He also developed the scoring system used today in Division I men's and women's dual matches. For more on his illustrious career, see this tribute from the school's athletic website. Gabby Andrews was surrounded by three generations of her extended family Sunday, all of them smiling broadly after her 3-6, 6-2, 6-1 win over Denise Starr in the championship match of the USTA Girls 18s Clay Courts. Andrews' father grew up in Memphis, but moved to Southern California before his daughter was born, so the tournament is the 14-year-old's yearly trip to reconnect with her grandmother, great aunt, aunts and uncles, as well as several young cousins Andrews admitted she was just getting to know. As the several dozen family members sought relief from the baking midday sun under the Racquet Club of Memphis's ample shade tree, Andrews could provide even more good news for them: she will be back in February, to use the qualifying wild card into the Memphis WTA event that goes to the Girls 18s Clay Courts champion. The family reunion atmosphere was much more subdued after the first set of the match, when the unseeded Starr broke top seed Andrews three times, looking much more comfortable despite playing in her first National Championship final. Andrews, who described her play in the first set as erratic and impatient, didn't give her supporters much to cheer about. That changed quickly in the second set, when a determined Andrews settled down, stopped making unforced errors and started to hit through the court with a sense of purpose. Up 4-0 in short order, Andrews hit a minor speed bump when she was broken to make the score 4-2, but she resumed her two-break lead in the next game, when at 30-40, she hit a perfect lob over Starr, who could only watch in dismay as it dropped six inches inside the baseline. Andrews held in the next game, although she had to save a break point, to even the match at a set apiece. During the 10-minute break, Andrews and her father sat in the shade near the court, but away from any interruptions, and talked briefly about what her approach should be for the final set. "Just relax, and that's it. He only said like one word to me," said Andrews, still amazed at his brevity. "He was just standing there, swaying back and forth, and I was like, okay Dad, thanks. I'll take that." In the third set, Starr was broken in the opening game, but Andrews, who admitted she was nervous when the set began, saw a 40-15 lead in the second game slip away, and it was 1-1 when Starr cracked a return winner on her second ad. Starr lost her serve again in the next game however, and Andrews began to sense she had the upper hand. "I tried to make her move more, because when she was set up, she could just dictate, and I found myself running from side to side," Andrews said. "I had to make a change, so I decided to hit more drop shots, the best part of my game, and that worked out. I moved her around so I could get that short ball and dictate." Between the drop shots and the increased depth she was getting on her ground strokes, Andrews began to force Starr into more errors. With Andrews taking a 5-1 lead, it was tempting to write Starr off, but she had won the final six games of her semifinal match on Saturday against Stephanie Vlad, so Andrews knew better. "She's a streaky player," said Andrews. "She looks like she's not into the match when she really is. I did not feel comfortable, not one bit." Because she was unseeded, Starr was playing her eighth match in eight days, with the last four all going three sets. "I just ran out of steam, and she's a really good player," said Starr, a 16-year-old from New York. "She really didn't let me come back. She wouldn't let me pass her and she hit winner after winner." But for all her physical struggles and Andrews' renewed confidence, Starr did not go quietly in the final game. Serving at 1-5, Starr saved four match points in the eight-deuce game, although the third and fourth came on backhand return errors from Andrews, which produced a rare show of frustration from her--a scream and a swipe at the Har-Tru with her racquet. On the fifth match point, Andrews decided to go for a second serve return on the forehand side instead, and it paid off when she hit a clean winner to end the nearly two-hour contest. Although disappointed with her performance in the final two sets, Starr saw the positives in her breakout tournament. "I learned that I'm physically stronger than I thought I was," said Starr, who beat the No. 2, No. 7 and No. 9 seeds among her seven victories. "And that I can do things myself, because I don't have a coach, and it depends on me. And I have a better game than I thought I had." As for Andrews, she had already reached the goal she had set for herself Saturday, when she made the championship match. "I wanted to make it the finals, because I made the semifinals last year," said Andrews, who mentioned returning to defend her title during remarks to the crowd after the match. "I always try to do better at a tournament than I did the year before. And I won it. It's amazing, it's awesome. I'm excited to come back here (for the WTA tournament) and see my family, because I only see them once a year." She may find she has even more cousins to get to know when that event rolls around in February. In the only other match played on Sunday, No. 5 seed Taylor Townsend defeated No. 15 seed Chalena Scholl 6-0, 6-0 to claim the consolation singles tournament, which is for fifth place. Makenzie Craft was named the winner of the sportsmanship award. For more on the Clay Court Championships in Florida, see collegeandjuniortennis.com. 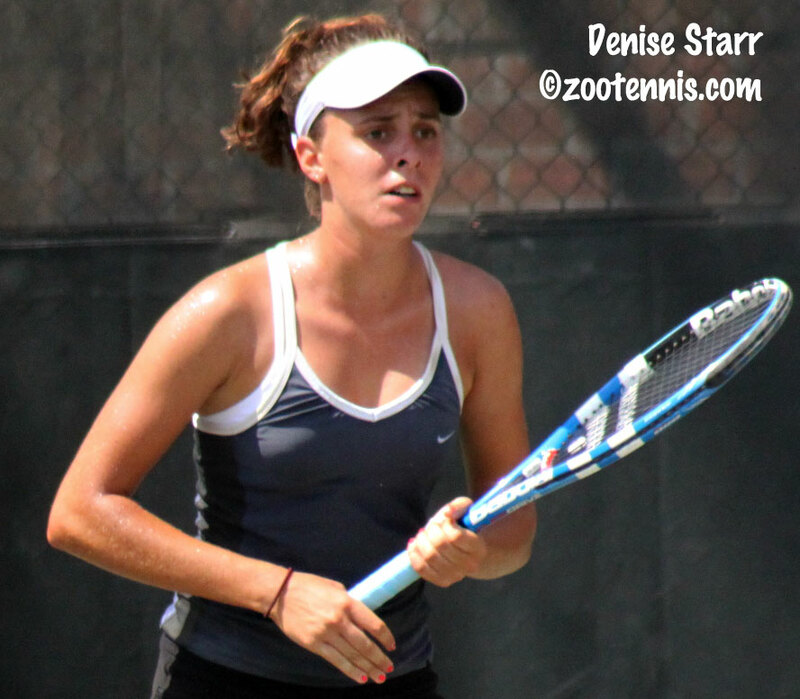 Unseeded Denise Starr has been able to shrug off first set losses all week, beating the No. 2 and No. 7 seeds from a set down. She put herself in an even more precarious position in the semifinals on Saturday against No. 9 seed Stephanie Vlad of Arizona, losing her first two service games in the final set before roaring back to claim a 3-6, 7-6(5), 6-3 win and a place in the championship match at the USTA Girls 18s Clay Courts. In the second set, serving from behind, Starr was two points away from defeat at both 4-5 and 5-6. 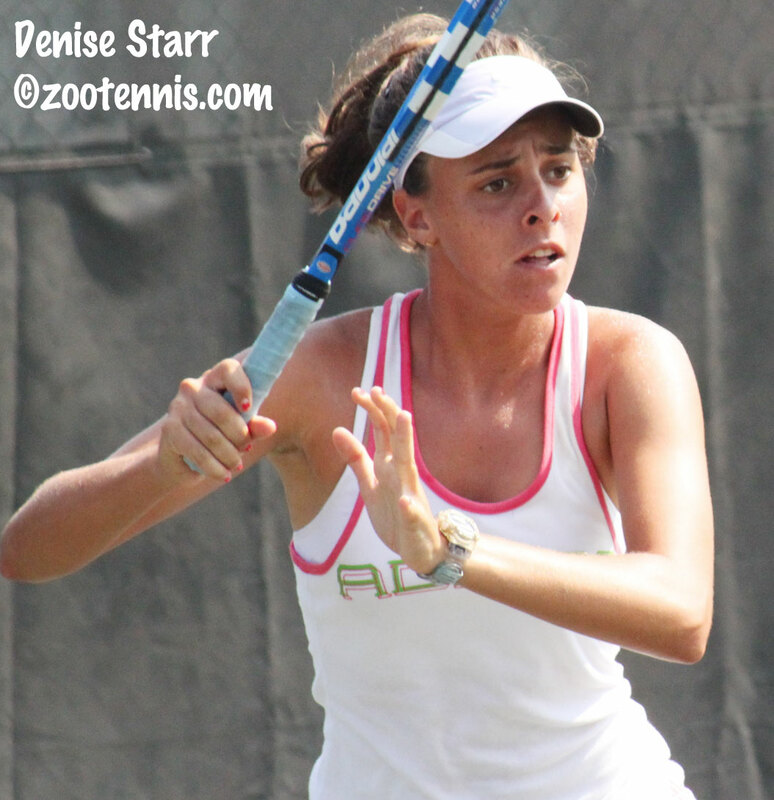 "I never really give up after I lose a set," said Starr, in the understatement of the week. "When I was down 5-4 and then 6-5, I was just concentrating on having a good serve, being aggressive." In the 30-all point at 4-5, Starr hit an excellent first serve and then ripped a forehand winner off Vlad's return to get a game point, and then pounded one of her many backhand winners to make it 5-5. At 5-6, Starr won the 30-all point when Vlad was forced into a forehand error, but that game went to deuce. Starr showed great touch on that deuce point, hitting a soft drop volley winner at the net, and when Vlad hit a backhand long, a tiebreaker would decide either the set or the match. Serving at 5-4 in the tiebreaker, Starr cracked a forehand winner to give herself two set points, but on the first she missed an overhead badly, yanking it into the bottom of the net. If that miss bothered her, she gave no outward sign, and with Vlad serving at 5-6, Starr teed off on yet another backhand with that clean winner sending the match into a third set. After playing two hours and ten minutes with the heat index in the mid-100s, Starr and Vlad were no doubt relieved to have a ten minute break, but it seemed to stall any momentum Starr might have had. Vlad broke Starr in the opening game, and then again in the third game, for a 3-0 lead, but that deficit actually helped the 16-year-old from New York. "When I was down 3-0 in the third, I felt I just let loose, could swing away, and that's what I did," said Starr, who received a USTA wild card into the tournament. "She's very consistent, and I had some trouble with that, but once I found my rhythm, I didn't let the ball come to me, I came to the ball, and that gave me a big advantage to hit winners on her all the time." Starr didn't look back after taking that advantage, while Vlad began to show frustration as her lead slipped away. With Starr serving at 3-3 deuce, another of the match's many pivotal moments, Starr hit two consecutive backhand winners, and Vlad bounced her racquet, drawing a point penalty for racquet abuse. While she complained that she wasn't given a warning, the call stood and she didn't win another point in the next two games, and after three hours, Starr claimed the victory. 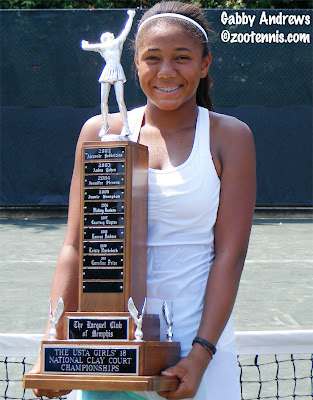 While reaching the finals of a National Championship is new for Starr, who will receive her first USTA championship ball on Sunday morning, win or lose, Gabby Andrews is familiar with the big stage, even at the tender age of 14. 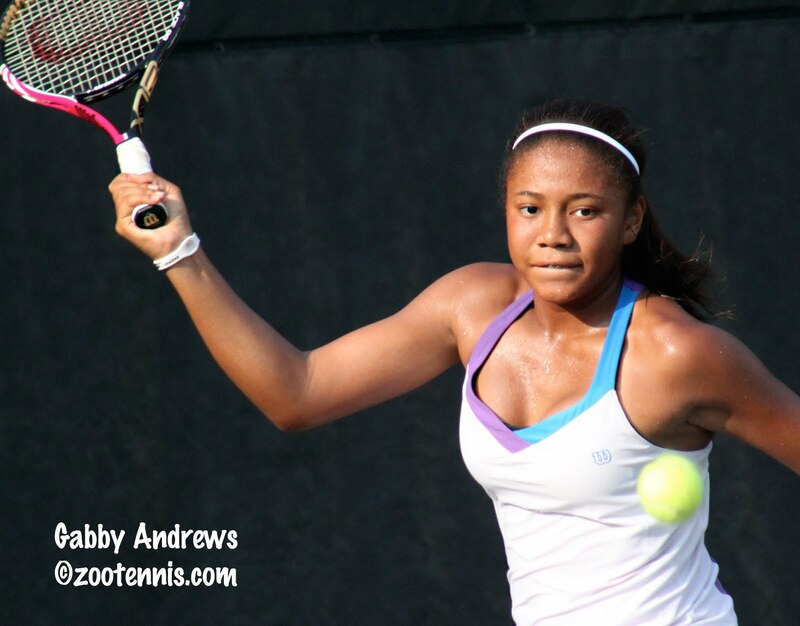 The reigning 18s Winter National champion, and a finalist at the Easter Bowl ITF this spring, Andrews earned her way into another final with a 7-6(5), 5-1 ret. victory over No. 3 seed Danielle Collins. The opening set was classic clay court tennis, with long points usually decided when one player worked herself in position to hit a winner. Collins led 4-2 in the first set, but Andrews won the next three games, and had two set points on Collins' serve at 4-5. Collins, a 17-year-old Floridian, was saved by a mark on the clay on the first, when the chair umpire reversed his call on closer inspection, and the second she saved herself, with a forehand putaway. After two more holds and an hour into the match, a tiebreaker would decide the set. And a high quality tiebreaker it was. Both Andrews and Collins hit winner after winner, and at 3-3, there were three consecutive drop shot winners--one by Collin, then two straight by Andrews. But at 5-5, Collins made her first error of the tiebreaker, netting a backhand, and Andrews seized the opportunity, crushing a backhand winner on the next point to take the set. The Californian admitted she had difficulty anticipating Collins' shots. "She was really smart," said Andrews. "She would mix it up really well, using the drop shots, then hit that high ball to get me to look at a different ball. It was a really tough first set." After the tiebreaker, Collins took a bathroom break to change her clothes, which she had done in her four-hour quarterfinal win over Hannah King on Friday, only this time, she also changed her shoes. None of the changes helped, with Collins falling behind 4-0 in short order. Collins did hold for 4-1, but with Andrews serving at 4-1, 15-0, Collins went down in the far forehand corner of the Stadium Court, and the chair umpire, Andrews and then shortly thereafter, the trainer, went to her aid. After a few minutes, and against Collins' coach's wishes, she continued to play, but Andrews finished off the game for 5-1. In the next game, Collins was obviously unable to serve and she retired at 0-15. Unable to make it into the clubhouse, Collins sat on another court chair, obviously in pain, and eventually she was taken by ambulance to a local hospital. She had mentioned on Friday her difficulties with her spleen since recovering from a bout of mononucleosis, and it was that problem that flared again, but she did not require hospitalization for the condition, and is expected improve with rest. Andrews and Starr have played, but it was a very long time ago. "I haven't played her since I was like 9," said Andrews, who won that match. "She's been winning a lot of three-set matches. She's a fighter and I have to come prepared, and play my best. Hopefully I'll keep my focus up the whole time." Andrews is dedicating her win in the semifinal to her cousin Kalim Smith, who last month was paralyzed in a workplace accident. "He's like my biggest fan," said Andrews, who plans to visit him when she plays the National Hard Courts near his home in San Diego. "It's really sad. He's in a wheelchair now. Tennis matches aren't what's important when you look at the bigger picture." The final is scheduled for 9:30 a.m. on Sunday at the Racquet Club of Memphis. The doubles final was played in the searing late afternoon heat, with No. 2 seeds Whitney Kay and Caroline Price winning gold balls with a 6-3, 6-4 victory over No. 4 seeds Lynn Chi and Chalena Scholl. Kay and Price, who met in the singles final last year, were both eliminated in their opening matches on Monday, so the future North Carolina Tar Heels were more determined than ever to capture the doubles championship. "I was telling Whitney after we finished that I think we had even more motivation after we lost in the first round," said Price, who added a gold ball in doubles to the one she won in singles on the same court last year. 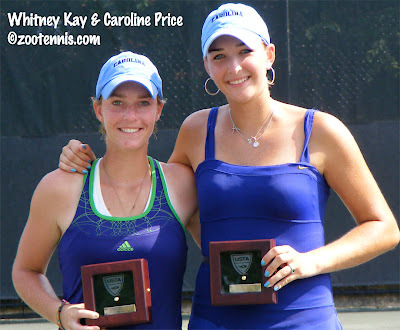 "We both lost to really good girls, we had tough draws," said Kay, who will join North Carolina in 2012, while Price starts her career at Chapel Hill next month. "You've got to pick yourself up and go get the next match." Kay and Price, both from suburban Atlanta, didn't lose a set in their six victories this week. Against Chi and Scholl, they made returning serve their focus, and they managed five breaks in the course of the match. "The key was mostly making solid returns and then being really aggressive at the net on our serves, not giving them a chance to beat us to the net," said Kay. Kay served for the match at 5-3, but didn't get a match point, as Chi hit two winners at deuce to get back on serve. The aggressive returning paid off for the champions in the next game however, and they broke Scholl at love to end their tournament on a much happier note than it began. "It definitely made up for the first round losses," said Kay. The pair will try to make it two National titles in a row next month at the Hard Courts in San Diego. The consolation final on Sunday morning will feature No. 5 seed Taylor Townsend against No. 12 seed Chalena Scholl. The two played in the main draw in the round of 16, with Townsend posting a tough three-set win after trailing 4-1 in the final set. For more from the Clay Court championships in Florida, see collegeandjuniortennis.com. Although the temperature was nominally cooler for the quarterfinals Friday at the USTA Girls 18s Clay Courts, reaching only into the mid-90s, the air was thick with humidity after thunderstorms Thursday evening. The energy-sapping conditions have proven no problem for wild card Denise Starr, however, as the 16-year-old New Yorker reached her first National Championship semifinal with a 5-7, 6-2, 6-2 win over No. 7 seed Samantha Crawford. Because Starr isn't seeded, she has already played six matches this week, with half of them going three sets. But as she proved against No. 2 seed Whitney Kay in the second round, Starr is adept at resetting her focus, even when down a set, and she stayed positive even when one of Crawford's many forehand winners were zipping past her. Starr served for the first set at 5-4, but couldn't close it out, and double faulted at 30-40 in her next service game, which gave Crawford the set. But she began to serve better in the second set, and returned well enough to engage Crawford in baseline exchanges. "Once I got the return back, I felt like I could start a rally," said Starr, who is training at the USTA Centers in both Boca Raton and New York. "I tried to keep it away from her forehand, because she just hits it as hard as she can, and gets everything in. And if she gets a good first serve in, there's no way I can even touch the ball." Crawford had come up with some big serves to stay in the match against Lynn Chi late in the third set on Thursday, but today she couldn't find that magic. Down two breaks in the third set, she got one of them back, but serving at 2-4 she lost a five-deuce game, unable to get any free points from Starr. "She would miss some first serves in crucial moments, and at game point on her serve, I would hit a down the line winner on my return," Starr said. Unlike when she served for the first set, Starr had the luxury of two breaks when serving for the match, producing an ace of her own early in the game, then finishing the win with an emphatic backhand winner. Starr admits that she's playing without any pressure this week. "I've had nothing to lose, and I just went out and played my best," Starr said, acknowledging her own high level in the last two sets against Crawford. Starr's semifinal opponent Saturday will be No. 9 seed Stephanie Vlad, who ended the Racquet Club of Memphis' hope for a hometown champion by defeating No. 4 seed Catherine Harrison 6-2, 0-6, 6-3. Vlad has no trouble against big hitters, as she proved on Thursday against Maci Epstein, saying she loves playing "people who give me pace." In the opening set, Harrison, one of those hard-hitters, made it easy for Vlad by making a lot of errors. Vlad, a 17-year-old from Arizona, made almost no mistakes herself, and Harrison began pressing, which led to more errors. But in the second set, it wasn't Vlad letting down, or making more errors that turned the match in Harrison's favor. It was Harrison raising her game, dictating play and winning countless points with drop shots. "She was missing a lot in the first set, and in the second set, the shots she was missing, either long or in the tape, she was starting to click, and they were going in," said Vlad, who reached the semifinals of the 2010 Winter Nationals after being out with a torn ACL. "She was being a lot more aggressive in the second. She was coming to the net and putting volleys away, keeping me on my toes, so she played a lot better." After a drop shot winner and an ace to close out the second set, Harrison probably would have liked to start the third set immediately, but the mandatory 10-minute break between sets, new this year for the 18s, gave Vlad a chance to regroup. She took a 2-0 lead, then saw Harrison win the next three games, and the first sign of frustration, in the form of yelling at herself, surfaced when she was broken in that fifth game. Harrison couldn't keep the lead, and the drop shot, so effective until that stage, let her down, as Vlad finally began anticipating it. When Vlad won the seventh game at love, she allowed herself to express some emotion, shouting "let's go," as she headed to the changeover leading 4-3. Harrison then played a sloppy game, making almost no first serves and spraying groundstrokes, the last two giving Vlad the game. To the dismay of the scores of fans supporting Harrison, Vlad had no trouble finishing out the last game, holding serve at love for the victory. 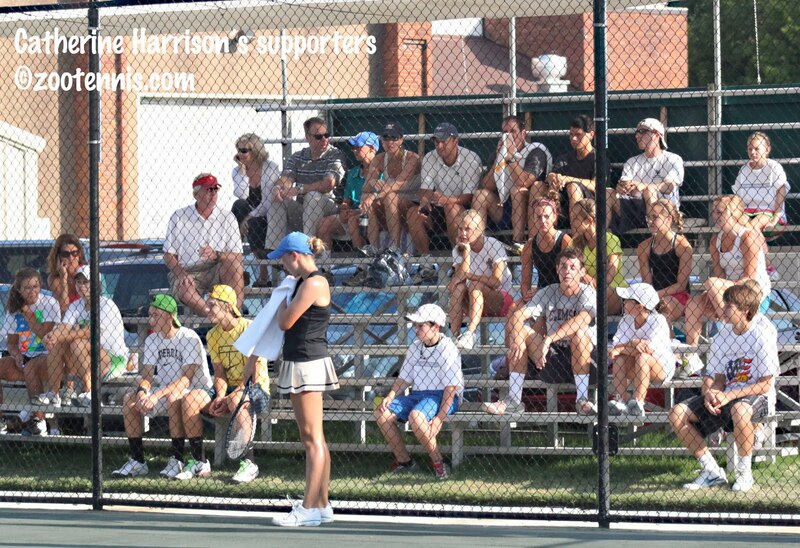 In addition to withstanding Harrison's barrage of winners in the second set, Vlad was also able overcome all the vocal support for Harrison. "It was a little distracting but I tried to stay focused, and didn't let them bother me," said Vlad, a rising senior who is still exploring her college options. "It's understandable because she's from here that a lot of supporters would come out to watch her. It was nice to play in front of a lot of people though." Top seed Gabby Andrews also has a local connection, with her grandmother and great aunt living in Memphis, where her father grew up. Just how comfortable she is at the Racquet Club, where she reached the semifinals last year as a 13-year-old, showed Friday morning, when she beat No. 5 seed Taylor Townsend 6-4, 6-2. Andrews had not beaten her friend and regular doubles partner Townsend in three previous meetings, and it looked like more of the same was in store when Townsend took a 4-1 lead in the opening set. Both players were making a lot of unforced errors and breaks of serve were commonplace. At 4-4 in the first, Townsend saved three break points and had four game points, but she lost her serve, giving Andrews the opportunity to serve for the set. When Andrews fell behind 15-40, it looked like the set would continue, but Townsend made errors on each of those chances, with her normally reliable forehand producing two more errors to give Andrews the first set. Andrews got out to a 3-0 lead in the second set, breaking Townsend in the first and third games, and although Andrews gave one of the breaks back, Townsend remained too erratic to put any real pressure on Andrews. Townsend is usually an emotionally charged player, with the energy nearly always positive, but whether it was the friendship or something else, that side of her wasn't evident today. "I noticed she was missing a lot of balls she normally wouldn't miss," Andrews said. "I don't know what happened. The last three times we've played, she was feisty, you know, get in my face, but I don't know about this one." Andrews said she is beginning to feel more comfortable on clay, thanks to her training on the surface, so rare in Southern California, at the Carson Player Development Center with Leo Azevedo. "I played smart clay court tennis," said Andrews, who also credits USTA National Coach Kathy Rinaldi for helping in her development. "I kept more balls in play, didn't go for too much, only went for it at the appropriate times." Andrews will play No. 3 seed Danielle Collins, who squandered a 4-1, two-break lead in the second set against No. 17 seed Hannah King before eventually claiming a 6-2, 5-7, 6-3 victory. The match took nearly four hours to complete, with not only the 10-minute set break, but also an "equipment" break for Collins, who excused herself to change clothing due to excessive sweating. "I usually sweat a lot, but not this much," said Collins, who is recovering from mononucleosis. "My doctor said you tend to sweat a lot when you have mono. I got overwhelmingly tired and it was hard for me to do what I needed to do on my serve." Collins served for match at 5-4 in the second set, but with two double faults, including one at 0-40, King pulled even. She held, and Collins still couldn't find the energy to serve properly, again double faulting on game point, this one a set point. After the break, which she spent talking with her coach Scott Dei, Collins came back more prepared to finish the task. "I started to shut up, calm down, and did what he said," Collins said. "I stuck to the game plan and stay positive for the most part, and just focused on playing each point." Neither player could hold serve in the third set, with five straight breaks before Collins held to make it 4-2. King, who didn't hold serve at all in the final set, did break Collins at 5-2 with a trio of outright winners, but she was unable to sustain any of that momentum in the final game, which ended with a King double fault. Collins and Andrews have never played, but Collins has heard about Andrews, who is almost exactly three years younger than the 17-year-old Floridian. "I'll have to bring the heat tomorrow, that's for sure," said Collins. "She's a really good player, a beast. She's had some really good results, and she's tough as nails, so I'll need to be well-rested and bring my A game tomorrow." The doubles finals are set, although only one of the semifinals was played Friday afternoon. Samantha Crawford, part of the top-seeded doubles team with Taylor Townsend, was unable to play due to an abdominal strain, so No. 4 seeds Lynn Chi and Chalena Scholl received a walkover into the final. Danielle Collins retired from her unfinished quarterfinal doubles match Thursday night without taking the court, putting Ashley Dai and Kelsey Laurente, the No. 9 seeds, in the semifinal against No. 2 seeds Whitney Kay and Caroline Price. Dai and Laurente were leading Collins and Maci Epstein 6-2, 4-2 when the rain suspended their quarterfinal match Thursday night. In the semifinal, there was very little to separate the two teams, with Dai and Laurente saving a set point with Kay serving at 5-4 in the first set and Price and Kay saving two set points with Price serving at 5-6. After the second seeds won the first set in a tiebreaker, they fell behind 3-1 in the second set, but won the next five games to post a 7-6(2), 6-3 victory. For more coverage of the USTA Clay Courts, see collegeandjuniortennis.com. Before today's quarterfinals at the USTA Girls 18s Clay Courts, here's a link to my weekly article for the Tennis Recruiting Network. Early this week, I spoke with one of the quarterfinalists, Catherine Harrison, about her tennis aspirations and where she is in the recruiting process. There was a message today for most of the players remaining in the USTA Girls 18s Clay Courts: the routine, straight-set victories are no more. On another suffocatingly hot day that saw the temperatures top out at an even 100 degrees, only three of the eight main draw matches were completed in straight sets. No. 3 seed Danielle Collins, No. 7 seed Samantha Crawford and No. 17 seed Hannah King all had to fight back from a set down in the energy-sapping conditions, and No. 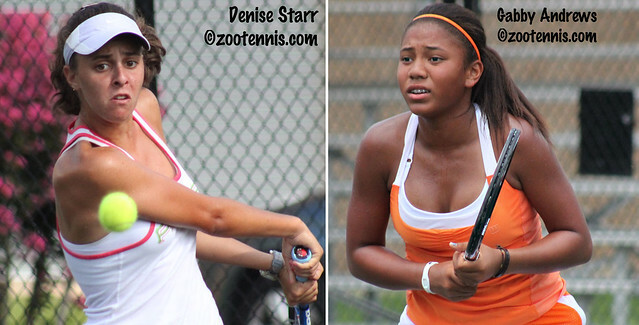 5 seed Taylor Townsend and Denise Starr also needed three sets and that many hours to advance. Townsend had won the first set from No. 15 seed Chalena Scholl 6-4, failing to serve out the set at 5-3, but breaking Scholl in the next game. Scholl was hardly deflated however, and took the second set 6-2, serving well and hitting with enough depth to keep Townsend from employing her attacking game. "She was mostly hitting a really good heavy ball," said the 15-year-old left-hander. "She was keeping me back, pushing me back deep so I couldn't do anything with the ball to get myself into the net. She was doing a good job of keeping patient and making me make the mistake." During the 10-minute break between the second and third sets, Townsend, who trains at the USTA Center in Boca Raton, consulted with National Coach Kathy Rinaldi about strategy. "She told me I had to keep my emotions in check, not too high, not too low," said Townsend. "And she was telling me to be patient, because I was forcing, making a lot of mistakes trying to force the ball. You can still play your game, but wait until you get the right opportunity." Rinaldi's advice didn't help Townsend avoid going down 4-1, with Scholl serving for 5-1 in the final set. But ultimately it did pay off, as Townsend started her comeback there, and won the last five games of the match to take the 6-4, 2-6, 6-4 victory. "I told myself to be patient, that the pressure was not on me, it was on her," Townsend said. "I played more free, more patient, waiting to get my right shot to come to the net. It worked well, because she started making more errors and that gave me a boost in the match." Townsend will play top seed Gabby Andrews in Friday's quarterfinals, after Andrews played some of her best tennis of the week in dismissing No. 10 seed Sydney Campbell 6-2, 6-1. Townsend and Andrews are close friends, with both describing the other as a sister, but both are determined not to let their relationship affect the match. 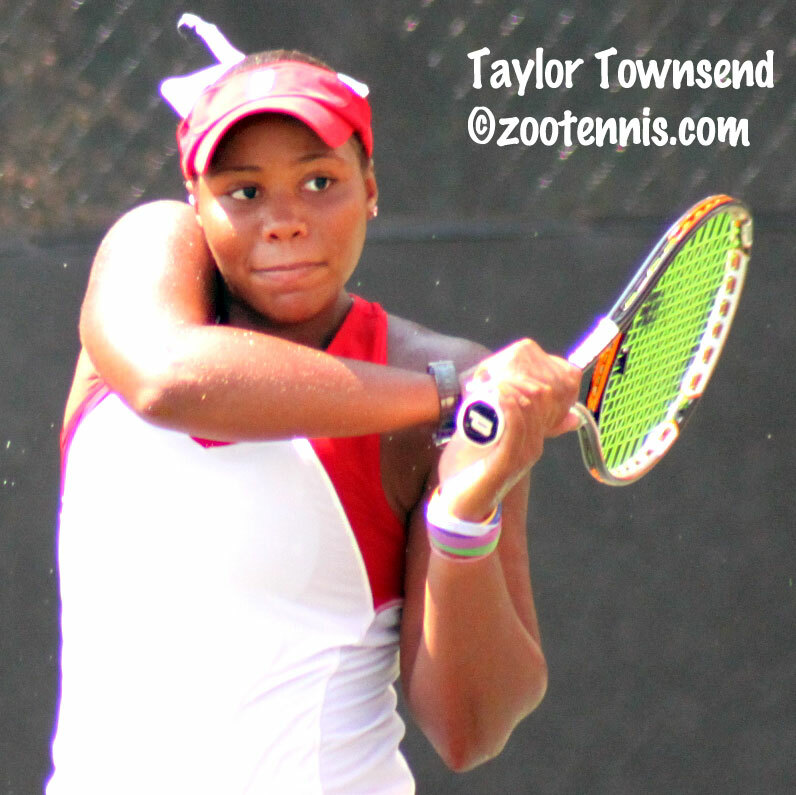 "It's competition, and we've got to put that aside," said Townsend, who has won all three of their previous meetings, including the most recent one, last year in the third round of the Atlanta ITF. "Off the court we're best friends and sisters, but on the court, we're worst enemies," she said with a laugh. "It's going to be difficult, of course it is," said the 14-year-old Southern Californian, who said she was looking forward to it nonetheless. "I'm playing practically my sister on the other side of the court. But once you're on the court, it's a different story." In the other quarterfinal in the top half, Collins will meet King after Collins defeated unseeded Katrine Steffensen 4-6, 6-1, 6-2 and King knocked off No. 8 seed Ronit Yurovsky 3-6, 6-1, 7-5. King, another 15-year-old left-hander, served for the match at 5-4 in the third set, but was broken to make it 5-5. Many of the points were long baseline rallies, so the serve wasn't a great advantage for either player, and Yurovsky dropped serve again to give King a second chance to serve it out. This time King had no difficulty, holding at love to avoid third set tiebreaker. In the bottom half, Samantha Crawford was on the brink of defeat in the third set against No. 16 seed Lynn Chi. After losing the first set 6-4, Crawford twice served for the second set, at 5-4, and 6-5, but couldn't hold either time. She dominated the tiebreaker to take it 7-6(2), then after the break had a 4-1 lead in the third set, only to see that evaporate. Having lost three straight games and serving at 4-4, Crawford was down 0-40, and just one more point would have Chi serving for the match. But an ace and a service winner made it 30-40 and on the next point, Crawford won a long forehand to forehand rally, with Chi hitting her final one long. Another service winner and backhand winner gave Crawford her fifth straight point and a 5-4 lead. Chi had a game point in the next game, but again sent a forehand long for deuce, and then another, giving Crawford a match point. When Chi's backhand went wide, Crawford had the victory that had seemed unlikely just a few minutes earlier. In the quarterfinals, Crawford will play Denise Starr, the only unseeded player remaining in the draw. Starr downed Samantha Asch, also unseeded, by a score of 6-1, 6-7(1), 6-1. No. 4 seed Catherine Harrison will relinquish her usual 8:00 a.m. start time on Friday to Andrews and Townsend, but the Memphis-area resident is still likely to have her share of fans when she plays No. 9 seed Stephanie Vlad in Friday's second match on Stadium Court. Harrison, the only player still vying for the title who has not dropped a set, beat No. 17 seed Julie Vrabel 6-2, 6-4, starting fast, as she has done all week. Vlad did not start fast against No. 17 seed Maci Epstein, falling behind 3-1, with Epstein serving at 40-15. But the hard-hitting Epstein lost that game and the next seven, as Vlad handled the pace and made few errors her 6-3, 6-1 victory. The doubles quarterfinals were played Thursday afternoon, or at least three of the four were. An evening thunderstorm disrupted the match between No. 3 seed Collins and Epstein against No. 9 seeds Ashley Dai and Kelsey Laurente. Dai and Laurente had won the first set and were up a break in the second when the skies opened, so I don't believe the match was completed. The top seeded team of Crawford and Townsend advanced to the semifinals with a 6-2, 6-4 win over unseeded Anna Mamalat and Rebecca Siegler. They will play Chi and Scholl, the No. 4 seeds, who beat No. 5 seed Andrews and Mia King 7-5, 3-6, 10-6. No. 2 seeds Whitney Kay and Caroline Price downed No. 6 seeds Harrison and King 6-2, 6-3, and will await the winner of the unfinished match. For more USTA clay court coverage, see Marcia Frost's collegeandjuniortennis.com. Former Kalamazoo College tennis coach George Acker was "Coach" to everyone who knew him, whether they played tennis or not. After suffering a stroke last week, the 82-year-old Acker died yesterday in Kalamazoo. The upcoming USTA Boys 18 and 16 National Championships will be an opportunity for all of us, not just in Kalamazoo, but throughout the college and junior tennis community, to reflect on his extraordinary contributions to the sport. Pam Shebest, the former Kalamazoo Gazette staff writer who covered tennis there for over 25 years, has written a remarkable obituary for today's edition of the newspaper. Former Kalamazoo tournament director Timon Corwin, who succeeded Acker as coach at Kalamazoo College, called him the "John Wooden of college tennis," which captures perfectly the respect and admiration felt by everyone who knew him. It was another scorching day for the fourth round of the USTA Girls 18s Clay Court Championships, but the top seeds didn't appear troubled by the heat and humidity, with Gabby Andrews, Danielle Collins and Catherine Harrison all managing straight set victories. The fourth-seeded Harrison's battle with 17 seed Jamie Loeb, who was a finalist at the Girls 16s Clay Courts last year, was expected to be very competitive, but Harrison took control from the beginning and posted a 6-0, 6-3 victory. Perhaps motivated by her loss to Loeb in the back draw at the 16s Nationals, Harrison came out very focused, served well and simply hit the ball too hard and too close to the lines for Loeb. The 16-year-old New Yorker never lost her composure and recovered from dropping the first eight games of the match to come within a point or two of pulling even in Harrison's final two service games. But she couldn't shake Harrison's confidence, and in just over an hour, Harrison completed the win by breaking Loeb. Top seed Andrews followed Harrison on Stadium Court, and a similar scenario began to unfold when ReeRee Li, a No. 17 seed, also lost the first set 6-0. But Li found her form, challenged Andrews, and even took a brief lead with a break in the fifth game of the second set. She gave it right back however, losing her next service game to make it 3-3. Li saved a match point serving at 4-5 with a big forehand that Andrews couldn't handle, and when she broke Andrews in the next game with a clean backhand winner, momentum seemed to be on the Yale recruit's side. But Andrews again got the break right back, aided by a Li double fault, and took the subsequent tiebreaker to post a 6-0, 7-6(2) victory. With third seed Danielle Collins taking a 6-2, 6-3 victory from No. 17 seed Ashley Noyes, that puts three of the four top seeds in Thursday's round of 16, with only No. 2 seed Whitney Kay, who lost in the second round, missing. But it's not any of the seeded players, 13 of whom have reached the fifth round, who have been most impressive this week. That honor would go to 15-year-old Katrine Steffensen, who has lost only eight games in her four victories. After beating defending champion Caroline Price in the second round 6-3, 6-0, Steffensen has rolled on, with her 6-1, 6-1 victory today over Madeline Hamilton, a 17 seed, vying for the shortest match of the day. Steffensen will play No. 3 seed Collins on Thursday. Denise Starr, another unseeded player who has had a big impact on the draw, beginning with her three-set win over Kay in the second round, didn't have it quite as easy as her doubles partner Steffensen today, but did post a 7-6(3), 6-2 win over unseeded Maegan Manasse. Maci Epstein, one of three No. 17 seeds to reach the fifth round (the others are Julie Vrabel and Hannah King), pummeled her way past No. 6 seed Ashley Dai 6-1, 6-2. Using her considerable power, Epstein kept Dai defending, and was able to get control of the points immediately on her service games. "I felt pretty good, and my serve was on. I think that's what gave me the match," said Epstein, who lost in the first round last year, and admits that clay is not her favorite surface. "But it calms me down, slows everything down. I can start rushing through things." Epstein is a rising senior, but is still early in the college selection process. As for the dozens of college coaches watching her win this afternoon, Epstein didn't find that stressful, only motivating. "It keeps me focused," said the Floridian. The lengthy clay court marathons haven't been much in evidence this week at the Racquet Club of Memphis, but there were two of them today in the fourth round. No. 9 seed Stephanie Vlad, who will play Epstein on Thursday, needed over three hours to subdue Taylor Davidson, a No. 17 seed, 6-2, 3-6, 7-5. And in the last singles match to finish Wednesday evening, Samantha Asch won another three-hour encounter, beating Rachael James-Baker 3-6, 7-6(5), 6-3 in a battle of unseeded players. Asch will play Starr on Thursday, ensuring that an unseeded player will reach the quarterfinals. The doubles quarterfinalists will be decided this evening, with several round of 16 matches still underway. 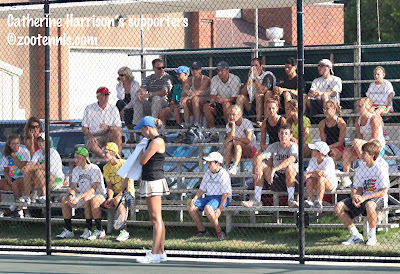 For additional coverage of the Clay Courts, see Marcia Frost's reports at collegeandjuniortennnis.com. It was unlikely that the third round of the USTA Girls 18s Clay Courts could match the drama of Monday's action, which saw both the finalists from 2010 lose their opening matches, and so it proved Tuesday. The pendulum definitely swung in the other direction, with only one Top 16 seed bowing out, and the rest rolling in straight sets on another very warm day at the Racquet Club of Memphis. No. 4 seed Catherine Harrison, the local product who has a permanent 8:00 a.m. start time on Stadium Court 4 just as long as she keeps winning, needed less than an hour to power her way past Aurora Garrison 6-1, 6-1. Harrison dropped the opening game, then went on to win ten games in a row before Garrison held her serve for the first and only time in the match. Danielle Collins, the No. 3 seed, struggled at times against Monica Lin, but Collins' service returns--especially aggressive on Lin's second serve--resulted in a slew of double faults from Lin. There were several very long games in the match, all on Lin's serve, but Collins won enough of those to earn a 6-3, 6-2 win. Top seed Gabby Andrews, who contributed to Monday's day of drama by dropping the first set against Julia Casselbury, had a much smoother second match, beating Mary Meyers 6-2, 6-1. On the adjacent court, her friend and frequent doubles partner (although not in this tournament) Taylor Townsend, the No. 5 seed, beat Madison Rhyner 6-2, 6-1 in just over an hour. With some welcome cloud cover providing a bit of relief from the temperatures in the upper 90s, there was still much to be said for getting off the court and into the shade or air conditioning, and two of Monday's heroes did just that. Denise Starr, responsible for the upset of No. 2 seed and 2010 finalist Whitney Kay yesterday, continued her excellent tournament, beating Mariam Zein 6-2, 6-0, as did Katrine Steffensen, who beat 2010 champion and No. 11 seed Caroline Price on Monday. Steffensen defeated Alyssa Smith, duplicating Starr's scoreline. 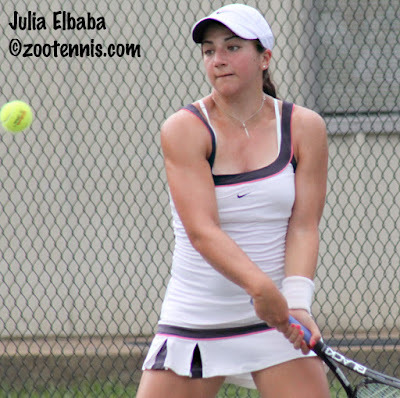 Another unseeded player having an impressive tournament is Julia Elbaba, who fashioned the one upset of the day at the Racquet Club of Memphis site, beating No. 13 seed Ellie Yates 7-5, 6-1. 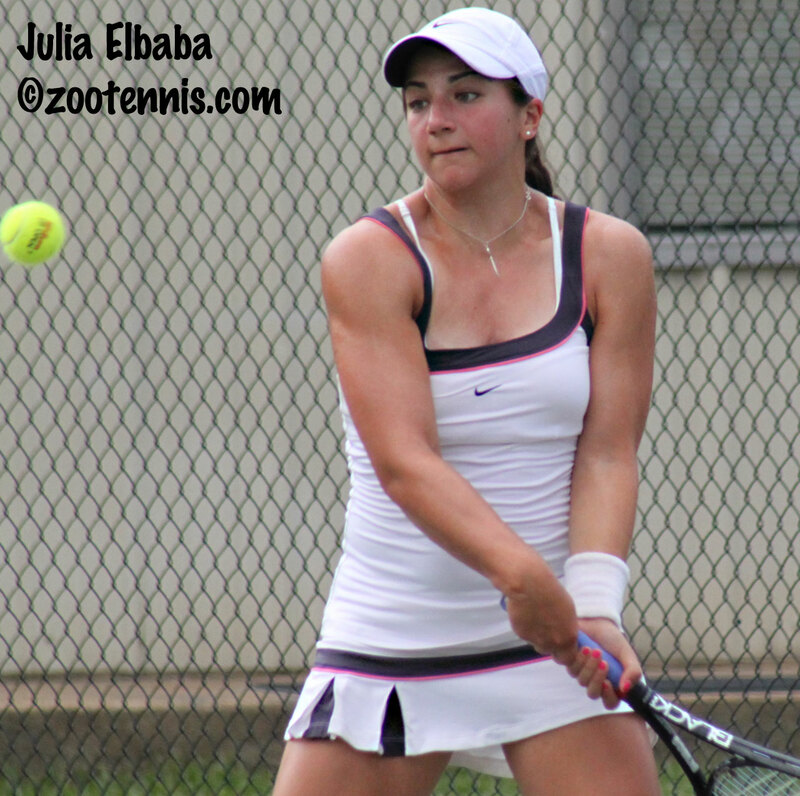 Elbaba trailed 4-2 in the opening set, but hit on a strategy that helped her win 10 of the next 11 games. "I just thought it would make the match easier to close out the points at the net," said the 17-year-old New Yorker, who moved forward at nearly every opportunity. "Before the match, it's not like I knew I was going to come into the net--it wasn't a 100% strategy for me--but I tried it a couple of times, and I saw it worked, so why not stick with something that's working." In addition to discovering a strategy that would allow her to use her volleying skills, Elbaba was also pleased with the emotional stability she showed during the match. "I was very positive, I was proud of myself," said Elbaba, who recently returned to the US after playing two ITF junior tournaments in Morocco on clay. "I didn't get down on myself, I stayed level-headed. I'm trying to work on staying focused and not wasting my energy on negativity. That helped me a lot today." There were no doubles played today, but the round of 32 in singles and the round of 16 in doubles is scheduled for Wednesday. For the draws, see the TennisLink site. Below are the additional wild cards for the Nationals in August. I posted the Kalamazoo wild cards last night. It's rare enough in junior tennis to have the two finalists from the previous year's tournament back to defend. To have them return and lose on the same day, to two doubles partners, well, that isn't likely to be repeated any time soon. 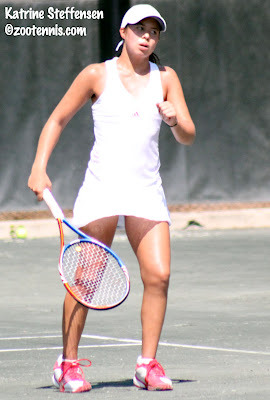 On a hot and humid second day of the USTA Girls 18s Clay Courts at the Racquet Club of Memphis, 15-year-old Katrine Steffensen of New York started the upsets when she defeated 2010 champion Caroline Price 6-3, 6-0. Katrine Steffensen, who at 5-foot-2-and-half-inches is approximately 10 inches shorter than Price, broke Price, the No. 11 seed, to open the match, and led the rest of the way, using her steadiness from the baseline and some excellent passing shots to keep Price off her game. Steffensen hadn't played Price before, but she knew Price was the defending champion, which she thought may have given her an advantage psychologically. "I knew she had won this last year, so obviously she's pretty good on clay, so I didn't really play with any pressure," Steffensen said. "I just tried to be aggressive, but patient at the same time, and I knew I had to serve well." She did that, never dropping her own serve, although in the first set, Price had several opportunities to get that opening break back, which she failed to do, and was broken to end the set. Knowing that she was unlikely to outsteady Steffensen from the baseline, Price came in at every opportunity, but Steffensen found ways to pass Price despite her considerable wingspan. "Usually I would hit a low shot, or pass her," Steffensen said. "I was trying to avoid hitting it right in her strike zone, because I knew she could easily put it away. She's crowding the net, so it puts pressure on me to make a better shot." Steffensen handled that pressure well, and rolled through the second set, emphatically denying Price the opportunity to repeat. Steffensen's doubles partner, Denise Starr, also from New York, had a decidedly longer road to her 6-7(4), 7-6(3), 6-4 victory over No. 2 seed and 2010 finalist Whitney Kay. Beginning around 1:30 p.m., and extending through the hottest part of the 94 degree day, the match ended over three hours later when, with Kay serving at 4-5, 15-40, Starr held her ground in a long baseline rally until Kay found the net with a forehand. Starr had been unable to close out the match serving for it at 5-3 in the third, and she had had a similar problem in the second set, when she was up 4-2 and serving at 6-5, but still was forced to win the tiebreaker to extend the match. Several doubles faults at key moments proved costly to the 16-year-old right-hander, and she acknowledged her struggles in that department. "My second serve hasn't been that good the last four months, and I've been working on it," said Starr, who recently reached the semifinals of a $10,000 Pro Circuit event in Delaware, beating Steffensen in the quarterfinals there. "It's kind of on and off. When I'm emotionally down, it stops working, and when I'm emotionally up, it starts working again." Even with an inconsistent second serve, Starr was able to keep great depth on her ground strokes, and she collected many points by keeping Kay on the defensive. "I knew she doesn't really hit the ball that hard," said Starr, who generates a lot of power when she has time to set up her long forehand stroke. "She's consistent, so my game plan was to be aggressive, so she wouldn't push me to make a mistake." The 10-minute mandatory break between the second and third sets did nothing to stall Starr's momentum and she took a quick 3-0 lead, breaking Kay in the second game with a backhand winner. Starr held her advantage until serving at 5-3, but a couple of forehand errors at 30-30 gave Kay hope. Kay couldn't capitalize however, and a double fault put her in a 0-30 hole at 4-5. Another unforced error, this one a backhand into the net, gave Starr three match points, and although Kay survived one when Starr's backhand went wide, she couldn't find the consistency she needed in that final point. In addition to Price and Kay, a few other seeds lost their opening matches, although only one other Top 16 seed, Madeline Lipp(12), who fell to Rachel James-Baker 6-3, 6-2. No. 17 seeds losing were Makenzie Craft (to Lindsay Graff), Tina Jiang (to Laila Judah) and Crystal Yen (to Samantha Asch). Another colossal upset was also on the horizon when top seed Gabby Andrews dropped the first set to Julia Casselbury, but Andrews recovered for a 4-6, 6-3, 6-3 victory. Casselbury played aggressive tennis in the opening set, and Andrews didn't control the court with her backhand, as she often does. Casselbury sent back most of Andrews' winners, which Andrews admitted surprised her. "She got to a lot of balls that I didn't expect her to get," said the 14-year-old Californian, who reached the semifinals here last year. "I wasn't ready for that extra ball and then would just spray it. She was a really good player, and it was a good first round." In the second set, Andrews took a 4-1 lead and managed to save two break points serving at 4-2 to assure she would even the match. She served out the second set at love, and came back from the 10-minute break to take a quick 3-0 lead. Up two breaks, Andrews gave one back immediately, and serving at 3-2, she was down break point when she came up with a perfectly executed drop shot winner. "I thought, why don't I just hit a drop shot and see what happens," Andrews said. "I take risks. I don't even know why I did it, because she was getting to all my drop shots." Casselbury didn't get to that one, Andrews held for 4-2 and although Casselbury, a 17-year-old from Pennsylvania, kept the pressure on by holding her next two service games, Andrews served out the match without much drama. No. 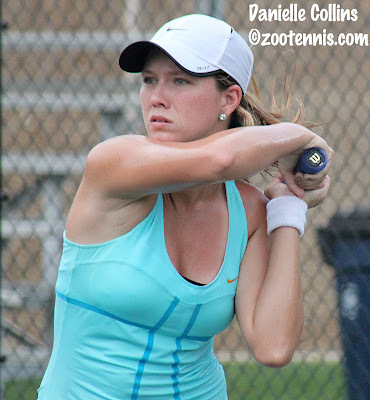 3 seed Danielle Collins was also pushed to three sets before overcoming fellow Floridian Courtney Colton 6-3, 4-6, 6-4. No. 4 seed Catherine Harrison was the only top 4 seed to win in straight sets. Harrison, last year's bronze ball winner, beat Sarah Gealer 6-4, 6-1. The second and third rounds of doubles were scheduled for today. In another coincidence, Kay and Price were set to play Starr and Steffensen in a third round doubles match. For those results, and the complete singles draws, see the TennisLink site. I've got a lot of writing to do after all the excitement today at the Girls 18s National Clay Courts, but I wanted to get the list of wild cards for the Kalamazoo Nationals up as soon as possible. I hope to have the wild card lists for the other National Hard Courts by tomorrow. It's been a long day of travel, but I'm here in Memphis for the USTA Girls 18s Clay Courts, and I'll have live coverage beginning Monday and extending through the final next Sunday. The first rounds of both singles and doubles were played today, with seeds taking the court for the first time in Monday's second round. Dangerous unseeded players Katrine Steffensen, Julia Elbaba, Kelsey Laurente, Anna Mamalat and Denise Starr all won today; Steffensen will challenge defending champion and No. 11 seed Caroline Price tomorrow and finalist Whitney Kay, the No. 2 seed, will be tested by Starr in Monday's action. The Memphis Commercial-Appeal has been covering local junior Catherine Harrison's participation in this event for all four years I've been attending this tournament, and this year she's the subject of a more in-depth feature that focuses on the improvements she's made in her game. The No. 4 seed in the tournament this year, Harrison says her backhand and fitness are both improved over a year ago, when she made the semifinals, and says, "This year, I don't feel I have a weakness. I like all my strokes." In the $10,000 Atlanta Pro Circuit event, top seed Lauren Davis beat No. 2 seed Alexis King 1-6, 6-2, 6-2 to win her second tournament this month and her tenth match in a row. Davis is next scheduled to compete at this week's $50,000 event in Lexington Kentucky, but the main draw has not yet been released. See the Pro Circuit page at usta.com for the results of the other finals this week and qualifying for upcoming tournaments. In Austria today, Allie Kiick lost in the final of the ITF Grade 1, dropping a 3-6, 6-2, 6-1 decision to No. 7 seed Klara Fabikova of the Czech Republic. Dennis Novak of Austria, the No. 4 seed, beat top seeded countryman Patrick Ofner 5-7, 6-4, 6-3. At the Grade 1 in Morocco, Matias Sborowitz of Chile and Indy De Vroome of the Netherlands were the winners. William Kwok of the US won the boys doubles with Yoshihito Nishioka of Japan. Unseeded Austin Siegel of the US won the ITF Grade 4 in Curacao, beating top seed Robert Livi of the US 6-3, 6-4 in the final. Siegel and Walner Espinoza of Panama also collected the doubles title. Irina Falconi cut short her training sessions post-Wimbledon to help the Boston Lobsters, whose replacement for CoCo Vandeweghe, Chanelle Scheepers, was injured. This Boston Herald article explains how the former Georgia Tech All-American ended up playing World Team Tennis this month, on very short notice. Qualifying began today in Atlanta for the ATP event, and there were plenty of familiar names in the draw. Wild card Wil Spencer of Georgia won his opening match against No. 8 seed Nick Lindahl of Australia, with Lindahl retiring after Spencer won the second set, resulting in a 6-7(2), 6-3 ret. score. I'm not sure if Lindahl has a chronic injury, but this is only his fifth event of the year, and he has now retired from three of them. Spencer plays former Texas player and Haiti Davis Cup member Olivier Sajous in the second round. For more on Spencer's win, including his reaction to the match, see georgiadogs.com. Austin Smith, a wild card who trains at Racquet Club of the South, the tournament's new home, defeated former Georgia Bulldog Nate Schnugg 6-3, 7-5 to advance to the second round of qualifying, where he will play No. 7 seed Denis Kudla, who also advanced via retirement. Smith, a finalist at the 18s Spring Nationals this year, probably received a large number of phone calls on July 1, when college coaches could telephone the rising senior for the first time. Dan Kosakowski won his opening match, as did Gabriel Townes, who played at Georgia State as a freshman, but is not listed on their 2011-12 roster. Mac Styslinger, who was rather comically called Mark Spyslinger in the initial draw and order of play that was released last night, also won today. Things get tougher for those three on Sunday, when Styslinger meets top seed Marinko Matosevic of Australia, Townes plays No. 4 seed Tim Smyczek and Kosakowski faces No. 2 seed Matthew Ebden of Australia, who made a quick trip east after losing at the Aptos challenger. Ryan Harrison and Donald Young received main draw singles and doubles wild cards and will be playing doubles together, as will former University of Virginia teammates Somdev Devvarman and Treat Huey. Wild cards Drake Bernstein of Georgia and Kevin King of Georgia Tech drew top seeds Rajeev Ram and Scott Lipsky in doubles. Three of the eight seeds in the singles draw were in the semifinals of the 2007 NCAAs: No. 2 seed Kevin Anderson, No. 3 seed John Isner and No. 8 seed Devvarman. Complete draws can be found at atlantatennischampionships.com. Ken Thomas is webcasting from the event at radiotennis.com. Also in Atlanta today, but at a different venue and level, top seed Lauren Davis and No. 2 seed Alexis King advanced to the final of the $10,000 women's Pro Circuit event. Davis beat Lauren Embree 6-4, 6-3, and King beat Taylor Townsend by the same score. Florida sophomore Alex Cercone and Tennessee senior Natalie Pluskota took the doubles title. The unseeded pair beat No. 2 seeds Alexandra Hirsch and Amanda McDowell 7-5, 4-6, 10-8. For complete results, see the Pro Circuit page at usta.com, which also has the qualifying for the four Pro Circuit events next week. The Evansville $10K for women doesn't have a single seed in the qualifying, meaning that no one has a WTA ranking. This is a result of the USTA Clay Courts and the Lexington Challenger being held the same week. Allie Kiick has advanced to the finals of the Grade 1 in Austria with a 6-4, 6-4 win over No. 2 seed Anett Kontaveit of Estonia. Kiick has yet to lose a set in her five matches on the red clay. She will play No. 7 seed Klara Fabikova of the Czech Republic, who took out top seed Jovana Jaksic of Serbia in today's semifinals. The third and final Opportunity Tournament, which will decide a qualifying spot in the WTA Mercury Insurance Open in La Costa, has reached the finals, with 15-year-old Christina Makarova meeting Texas A&M junior Nazari Urbina. Urbina won a similar wild card tournament last year. Zoe Scandalis, the USC recruit who won the second Opportunity Tournament, is featured in this article from the North County Times. NCAA champion Steve Johnson was the subject of several features during his stint last week as Davis Cup practice partner in Austin, I did an interview of my own, by phone, for my Tennis Recruiting Network weekly article. I also spoke to USC head coach Peter Smith and Johnson's father, Steve Sr., for a piece I am writing about Johnson for SMASH. The focus of that article, which will be available only to junior members of the USTA via smashtennis.com, is Johnson's decision to return to USC in January of 2012 to try to win a fourth straight team championship. It's important to him, as he makes clear at the end of the Tennis Recruiting article, and unlike Tennessee's Rhyne Williams' wait-and-see-stance about his professional future, I don't think there's any doubt Johnson will return to USC for his last semester of eligibility. The Intersectionals, the USTA's coed, 16-and-under team event held every year in Shreveport, La., finished yesterday, with the top-seeded Southern California sectional team taking the title over the Southern section 7-2. It was odd to see Ashley Dai, who won all four of her singles matches for Southern California, playing in a 16s competition, as the University of North Carolina recruit has been playing 18s for several years, but I'm sure coach Brett Masi was happy to have her. It's great for junior tennis fans that the local newspaper, the Shreveport Times, gives the event such thorough coverage every year, providing stories and photos each of the five days of the event. This is their article on yesterday's final. With the confusing way the TennisLink site works for this kind of event, I'm not sure I would have figured out who had won the tournament without the newspaper to help me. Speaking of confusing, there was a new NCAA rule proposed that would allow more phone calls to recruits and earlier contact, but it will not happen, after the initial decision in favor of the change was overturned yesterday. Thanks to Marcia Frost, Dallas Oliver of Tennis Recruiting and Erica Perkins Jasper at the USTA, I think I finally have a grasp of the situation. This link from ncaa.org explains that the Legislative Council reversed its earlier support of the proposal, and a vote to override will not be necessary, although there is still a chance the Board of Directors could revisit the issue next month and request an override vote. For now there will be no extra phone calls come August 1. At the Aptos Challenger, Jack Sock lost his second round match to No. 3 seed Matthew Ebden, the second time this year Sock has dropped a three-set decision to the Australian after winning the first set. Former LSU star Michael Venus, who just returned to the US after a successful Davis Cup tie for New Zealand, reached the quarterfinals. All of the junior players are out of the $10,000 men's Futures in Rochester, with Bjorn Fratangelo, Jason Tahir, Mitchell Frank and Michael Redlicki all losing in the second round. Qualifier Redlicki did earn his first ATP point however by posting a first round win over Dmitri Marfinsky of Russia. In the Atlanta 10K, top seed Lauren Davis and unseeded Lauren Embree will meet in one semifinal, with No. 5 seed Taylor Townsend playing No. 2 seed Alexis King in the other. If Townsend beats King Saturday, I suspect she will not play the Clay Courts in Memphis, but I've been wrong about that kind of decision before. Because she is seeded, Townsend will not play singles in Memphis until Monday, which makes it feasible. Last fall, Lauren Davis won a 10K in Williamsburg, Va. and flew all the way to Tulsa that night to play in the ITF B1 Pan American Closed the following day, so it is possible, although obviously not ideal. The doubles final on Saturday will feature two current and two former college players. Florida sophomore Alex Cercone and Tennessee senior Natalie Pluskota, who are unseeded, will face former Wake Forest standout Alexandra Hirsch and 2008 NCAA champion Amanda McDowell of Georgia Tech, the No. 2 seeds. At the ITF Grade 1 in Austria, Allie Kiick has reached the semifinals. In today's quarterfinals, the unseeded Kiick beat No. 4 seed Ellen Allgurin of Sweden 6-0, 6-2, the third seed she has beaten this week. Although not all the draws have been posted for the USTA National Clay Court championships, the seeds for each of the eight tournaments are available at the TennisLink sites, which are linked below. In Delray Beach, Alexios Halebian is the No. 1 seed in the boys 18s, followed by Emmett Egger, Spring National champion Zack McCourt and Anthony Tsodikov. Halebian lost to Bjorn Fratangelo in last year's final. I was surprised to see wild card Spencer Newman go unseeded, after completing a dual match season at SEC tournament champion Florida. He also has recorded a couple of wins in Futures events in the past few months. The draws are out for the boys 16s and 18s, and the seed in Newman's part of the draw is No. 13 seed Nolan Paige. Jeremy Efferding is also not seeded, and he could face longtime friend and rival Egger in the round of 64. Thai Kwiatkowski is another dangerous floater and not who No. 5 seed Andrew Adams was hoping to encounter in his opening (second round) match, should Kwiatkowski beat Max Schnur in the first round. Easter Bowl finalist Ronnie Schneider is the top seed in the boys 16s, followed by Winter National champion TJ Pura, International Spring champion Noah Rubin and Luca Corinteli. Henrik Wiersholm and Stefan Kozlov are both playing up prior to leaving for the ITF World Junior Tennis 14-and-under competition in the Czech Republic. Kozlov is seeded 12th, Wiersholm is not seeded. Gabby Andrews is the No. 1 seed in the girls 18s at Memphis, which I will cover live beginning on Monday. Andrews, the Winter National champion and Easter Bowl finalist, is followed in the seedings by 2010 finalist Whitney Kay, Spring National champion Danielle Collins and local star Catherine Harrison. Defending champion Caroline Price is seeded No. 11. In the girls 16s in Virginia Beach, the top seed is Shannon Hudson, playing in her hometown, with Quinn Gleason, Alanna Wolff and Lauren Marker in the 2, 3, and 4 spots. Martin Joyce, Robert Seby, Tommy Paul and Francis Tiafoe are the top four seeds at the boys 14s in Ft. Lauderdale. At the girls 14s in Plantation, the top seed is Katerina Stewart, followed by Lauren Goodman, Marie Norris and Rebecca Weissman. The top seed in the boys 12s in Winston-Salem is Noah Makarome, with Noah Schachter, Patrick Kypson and Nathan Perrone at 2, 3, and 4. Catherine Bellis in the No. 1 seed at the girls 12s in Boca Raton, followed by Ryan Peus, Kayla Day and Anna Bright. The quarterfinals are set at the $10,000 Women's Pro Circuit event in Atlanta, with top seed Lauren Davis among those advancing. Davis, who won the tournament in Buffalo last week, will play former Bollettieri student Di Zhao, an 18-year-old from China. No. 3 seed Amanda McDowell, who won the US Open Sectional Playoff earlier this month in the Southern section, will play wild card Lauren Embree in the other quarterfinal match in the top half. In the bottom half, Taylor Townsend, who is the No. 5 seed in this pro tournament and the No. 5 seed in the 18s Clay Courts next week, meets No. 4 seed Angelina Gabueva of Russia, and 16-year-old qualifier Hayley Carter will play No. 2 seed Alexis King, who was Alexis Gordon when she starred at the University of Florida in 2001-2004. For more on the tournament, the Daily Forehand website is providing onsite coverage. And Ken Thomas will be webcasting again on Friday at radiotennis.com, beginning at 9:30 a.m. The complete results can be found at the Pro Circuit page at usta.com. Checking in with some of the US teens who are professionals now, Sloane Stephens did a conference call yesterday to promote her appearance at the new WTA event in the Washington DC area, the Citi Open, which begins July 23rd in College Park, Maryland. For more on that call, see Tennis Panorama's coverage. CoCo Vandeweghe has played World Team Tennis for the Boston Lobsters the past ten days or so, but is leaving the team to prepare for the WTA Bank of the West Classic at Stanford later this month. This Boston Herald article explores her popularity with Lobster fans and her reluctance to excuse herself from the WTT competition, although she will play one more match for the Boston team when they travel to Newport Beach, California.